Pastry chef Neil Robertson says, "After 57,590 kouign amann... I am quite frankly burned out." 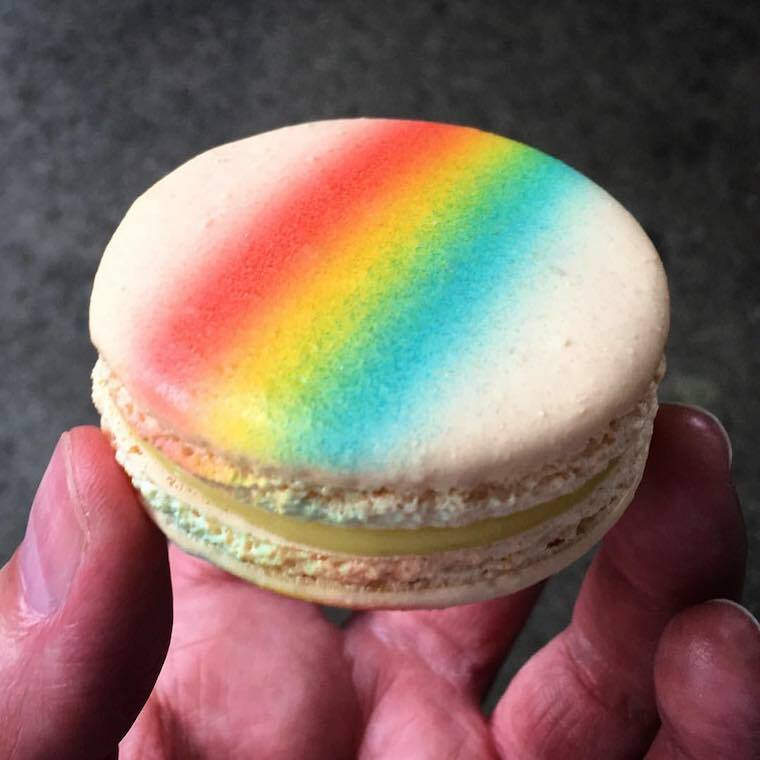 These lovely rainbow macarons filled the cases over the weekend for Pride. My single favorite pastry in Seattle is the twice-baked pistachio croissant that I’ve occasionally happened across—they don’t make them daily—at Crumble & Flake’s petite Capitol Hill shop. Sadly, news comes this morning that the bakery’s owner, the incredibly talented pastry chef Neil Robertson, is selling the shop. July 2 will be his last day running the kitchen. Robertson is a legend in this town, formerly a pastry chef at Mistral Kitchen and Canlis, and when he opened the space in 2012, pastries were sold out within moments. He tells me the new owner is Toby Matasar of Niche Café & Bakery, a dedicated gluten-free bakery also in Capitol Hill. No discredit to Niche or gluten-free bakers anywhere, but you can imagine my skepticism here. However, Robertson says he believes there will be as little changed as possible—he’s sticking around a couple of weeks to train Matasar on the equipment and recipes. “They say the two happiest days of a boat owner’s life is when he buys a boat and when he sells it. Turns out the same can be true for a business owner. I have loved my little shop and my days making pastries there. It was exactly what I had hoped it would be and much, much more. I have had some of the best employees I could have hoped for and I could not have made it past the first day let alone five years without them - thank you for your hard work and enduring my intensity and mood swings. We were blessed with customers that truly understood what were were trying to achieve and made us all the more determined to live up to their expectations. I would like to thank the local press for their support and recognition, which was an incalculable boost to our success (and egos). I have learned and grown in ways that were almost too much for my brain and body to handle. I certainly hope he finds his way back to the kitchen. Best of luck, Neil, and enjoy that rest!